The Restorative Justice Project is also committed to evolving the criminal justice system and serving the community. In 2013, RJP launched initiatives to engage with the Dane County community and beyond to transform justice, develop alternatives to the traditional legal system, promote restorative practices, and reduce racial disparity in the criminal justice system. Interested in Student/Community Engagement Projects? The Restorative Justice Project introduces students to restorative practices in both prisons and the community. Restorative justice acknowledges the depth and breadth of the harm caused by crime and violence, while seeking ways to address and repair it. In addition to prison-based programming, students have the opportunity to address conflict and harm in neighborhoods and schools. By utilizing restorative practices, students provide positive alternatives to the criminal justice system and build community. 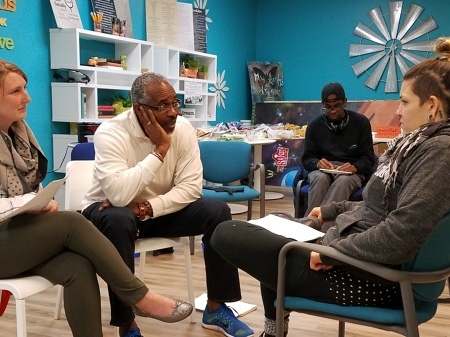 Students take on leadership roles in project areas that they are interested in, collaborating with community groups, nonprofit organizations, and schools to craft restorative responses to crime, violence, and other complex issues. Students, to learn more about the clinical experience and community engagement projects, visit the student page.